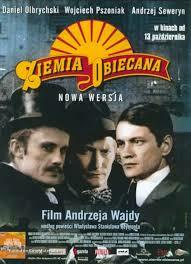 The Promised Land (Ziemia obiecana) is a 1975 Polish film directed by Andrzej Wajda, based on a novel by Władysław Reymont, 1924 Nobel Prize laureate. Set in the industrial city of Łódź, The Promised Land tells the story of a Pole, a German, and a Jew struggling to build a factory in the raw world of 19th century capitalism. Wajda shows a shocking image of the city, with its dirty and dangerous factories and ostentatiously opulent industrialists’ residences. Visually stunning (cinematography!! ), The Promised Land vividly depicts the lives of the three friends and their often ruthless pursuit of fortune. By focusing on these individuals, Wajda is able to show Poland’s 19th century ascension from ancient feudalism to modern multiethnic capitalism. The film was nominated for the Academy Award for Best Foreign Language Film and appeared in Martin Scorsese Presents: Masterpieces of Polish Cinema. The Promised Land will be introduced by Prof. Kat Dziwirek who’ll present her native Łódź, a city which in the 19th century experienced such a rapid growth in textile industry and in population that it became a multicultural metropolis virtually overnight.